Why Do Teens Turn to Alcohol? According to the Centers for Disease Control and Prevention (CDC), alcohol is the most commonly used and abused drug among youth in the United States. And just how commonly used is it? The 2013 Youth Risk Behavior Survey found that, among high school students, 35 percent drank some amount of alcohol, 21 percent binge drank. 10 percent drove after drinking alcohol, and 22 percent rode with a driver who had been drinking alcohol. Also in 2013, the National Survey on Drug Use and Health reported that 23 percent of youth aged 12 to 20 years drank alcohol and 14 percent reported binge drinking. And the Monitoring the Future Survey reported that 28 percent of 8th graders and 68 percent of 12th graders had tried alcohol. Because alcohol is easy to obtain and socially acceptable, it is a very popular means of self-medication for depression. Despite the fact that is illegal for young teens to purchase it, they are often able to get it through their parents' liquor cabinets, unscrupulous store clerks, or older friends who purchase it for them. Says Substance Abuse and Mental Health Services Administration (SAMHSA) administrator Nelba Chavez, Ph.D., "Parents need to know that alcohol use can also be a warning sign or a cry for help that something is seriously wrong in a child's life." People use alcohol for numerous reasons. 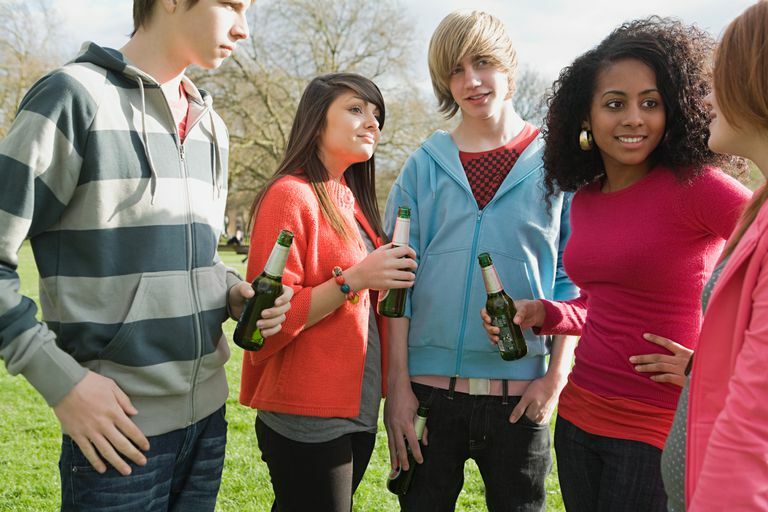 Peer pressure, celebration, anxiety, sadness, boredom, rebellion, and insomnia are just a few of the reasons your teen may be picking up that can of beer. It could also be argued that drinking to cope with depression has almost become a badge of honor in our society, a visible sign to the world that one is, indeed, hurting. Try to keep an eye out for the smell of alcohol on your teen's breath, slurred speech, and problems with coordination. These are all tell-tale signs of alcohol use. Drinkers tend to be more prone to unintentional injuries such as falls, car accidents, falls, drowning, and burns. Falling grades, skipping school, and behavioral problems are also more common in teen drinkers. You may also notice sudden changes in the friends your child is spending time with. Parental involvement is one of the keys to preventing teens from drinking. Take steps to educate your teen about the dangers of drinking and conduct ongoing conversations about alcohol. In addition, you should maintain a strong relationship with your teen, keep track of your teen's activities, teach your teen social skills, establish clear rules and consequences, and be a good role model. And if you suspect your teen's drinking is a sign of depression, seek out the help of a mental health professional. Centers for Disease Control and Prevention (CDC). Fact Sheets - Underage Drinking. National Institute on Alcohol Abuse and Alcoholism. Underage Drinking.